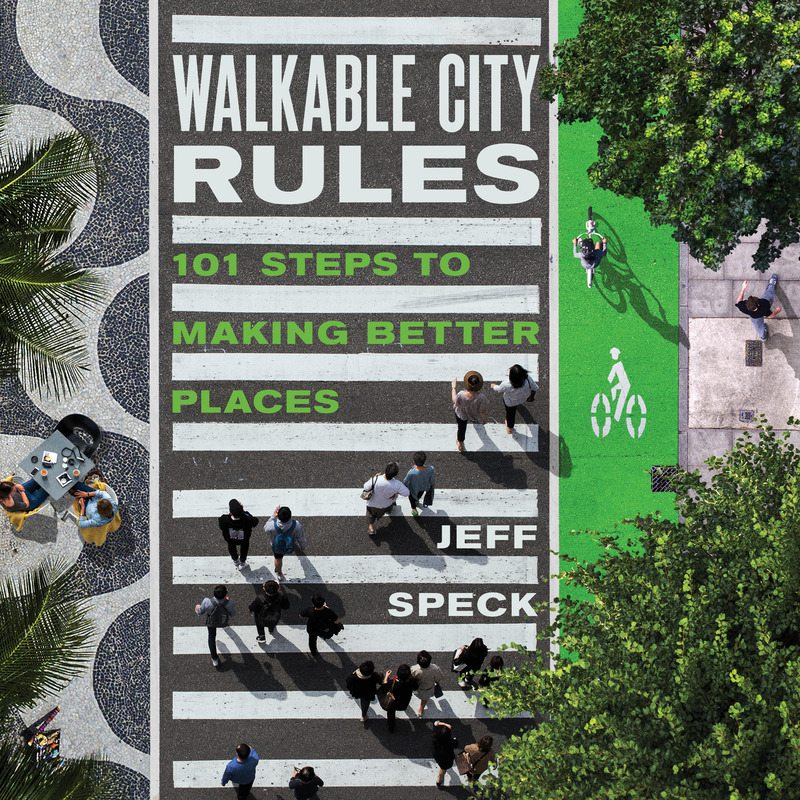 Streetsblog the exclusive right to publish a series of excerpts from Jeff Speck’s new book, Walkable City Rules (Island Press). These “rules” will be shared in conjunction with the book’s release this month. In many places, stop signs are the safest solution. For many years, cities inserted traffic signals at their intersections as a matter of pride, with the sentiment that more signals made a place more modern and cosmopolitan. Recently, that dynamic has begun to change, as concerns about road safety have caused many to question whether signals are the best solution for intersections experiencing moderate traffic. Research now suggests that all-way stop signs, which ask motorists to approach each intersection as a negotiation, turn out to be much safer than signals. Unlike with signals, no law-abiding driver ever passes an all-way stop sign at more than a very low speed, and there is considerable eye contact among users. This greater safety has multiple causes. Unlike with signals, no law-abiding driver ever passes an all-way stop sign at more than a very low speed, and there is considerable eye contact among users. People walking and biking are generally waved through first. And nobody tries to beat the light. While it would be useful to have more data, the main study on this subject, from Philadelphia, is compelling. It recounts the 1978 removal of 462 traffic signals due to a 1977 state ruling disallowing signals at intersections with limited traffic. In almost all cases, the signals were replaced by all-way stop signs. The overall reduction in crashes was 24 percent. Severe injury crashes were reduced 62.5 percent. Severe pedestrian injury crashes were reduced by 68 percent. While some pedestrians and drivers prefer signalized intersections, these data are too conclusive to ignore. Until a contradicting study is completed, cities should be compelled to conduct an audit of current signalization regimes to determine which signals may be eliminated. When converting signals to stop signs, cities face the choice of two-way and all-way stops. Clearly, if one street contains tremendously more traffic than the other, a two-way stop makes more sense. However, there is no doubt that all-way stops should be used wherever they do not pose an undue burden, as they are 50 percent to 80 percent safer than two-ways. Additionally, two-way stops hurt walkability, as they require people crossing the major street to dodge traffic. For this reason, it seems wise to leave signals in place in locations where an all-way stop is not justified. One great byproduct of converting signals to stops is money saved: stop signs are much cheaper to install and maintain than signals. This fact is important to keep in mind as one considers the conversion of a downtown’s streets from one-way to two-way. The principal cost of these reversions is signal reorientation. However, while signals are almost always required where multilane one-ways intersect, they are often not required where two-lane two-ways intersect. Moreover, when two-lane two-ways cross at a four-way stop sign, there is often no need or use for left-turn lanes, and that pavement can be used instead for parking or cycling. A word is also needed about the driver experience that accompanies the replacement of signals with all-way stops. It is true that, compared to a network of signals, a network of stops signs result in a drive that is interrupted by more pauses. But these pauses are all quite brief. Never does the driver have to sit and wait for a light to turn from red to green. Such waits at signalized intersections are often 30 seconds long or longer, and, across a network, can add up to a lot of time wasted. Surprisingly, more stops can mean a quicker commute. Finally, some air-quality advocates will argue against new stop signs due to the additional pollution caused by cars stopping and starting. This argument is accurate, but only in isolation, ignoring the smaller carbon footprint of more walkable places. As stop signs make places safer to walk, they can be expected to reduce overall driving, countering this impact. There is no reason to conduct an expensive study on this subject. For each intersection with traffic that is moderate and fairly balanced, conduct a one-week test of an all-way stop configuration. If problems don’t arise, make it permanent. One answer to that, which the weight weenies probably wouldn’t like, is to put enough ballast weight over the rear wheel so an endover is virtually impossible. I may even try to experiment a bit to determine exactly how much weight would be needed. If you have a rack over the rear wheel, putting the weight at the very end of that rack would be most effective. My guess is you might not need more than 10 or 20 pounds, perhaps less. Thus, i don’t think it should be assumed that cyclists are consistently able to come to a stop more quickly than motor vehicles. It’s never a good idea to ride in such a way that you’re relying on your maximum possible braking ability to get out of situations. I can stop very quickly if I have to, but in reality I hardly ever need to use my brake at all. I anticipate most situations such that if there is a need to reduce speed, I have enough space to do so just by coasting. The only time things take me completely by surprise is when small animals suddenly cross my path. Everything else, whether it’s potholes, children, other vehicles, and so forth can be anticipated well in advance. That’s exactly the problem with overuse of stop signs. No? I prefer biking through unsignalized intersections to those where I must keep one eye on the signal and the other on drivers flooring it to beat the yellow, and where I’m expected to stop and wait for 30 seconds every minute or so. I find the former are both less stressful and less strenuous. Which neighborhood are you thinking of? I had never seen an uncontrolled intersection until I visited Europe, so the concept was a shock to me when I took Traffic Engineering. It’s definitely the direction we should be going. City bikes also have the center of weight quite back on the bike to start with, and tend to be heavy enough you’re not going to wheelie it without really trying to wheelie it. As a result, you can take that front wheel almost to a skid one-handed and not go over the bars. Why there’s basically only one model on the USDM is beyond me, when that would serve most people’s needs most comfortably and effectively; instead Americans usually end up trying to adapt recreational sport models like road and mountain bikes to be something they aren’t. They’re typical in the US. Assuming there’s no busybodies pestering city council to solve nonextant problems, your average intersection is two residential streets with no traffic controls. This has been true in every city I’ve been to in the US and Canada thus far, and it’d be a shorter list to name the states and provinces I haven’t been to. Some places are better about taking a light touch than others, where minor intersections are controlled in Tulsa, it’s probably a two-way yield if sightlines allow for it, otherwise a two way stop. Exception being three way intersections, which are usually one-way yields, with some being one-way stops, if controlled at all (equal odds on it being controlled, with yield being the more typical situation in that case). Portland? Man, they don’t have enough money to pave all the city streets yet, but they also don’t know what a yield sign is, so stop signs are definitely more prevalent than in Tulsa, but overall I’d call even finding a controlled intersection a hard ask there. Stop signs used for speed control often increase the mid block speeds as drivers “make up time” for unnecessary stops. This is NOT a popular statistic, but it is a true one. Actually, stop signs are pretty rare in much of Europe, the Yield of Give Way protocol is far more common. Yield signs should be a LOT more common that stops. Utter nonsense. Roundabouts are better in almost every way. Signalized intersections carry special risks. Drivers often accelerate during the yellow phase to "beat the light," for instance, leading to high-speed crashes. Federal officials warn that improperly placed signals can "significantly increase collisions." So Seattle is reviewing 10 intersections to see if traffic signals should be replaced with stop signs. What Makes Some Intersections More “Elastic” Than Others?